Your RV search - If you plan on full time RV living then selecting an RV doesn't have to be confusing. You just need to consider your options to make the right choice. We make it easy to decide. When you begin looking remember there are no rules when it comes to selecting an RV for full time living. There are however things that will make living in one more comfortable and enjoyable. Remember when you start your RV search that as a fulltimer your looking for a home on wheels not just a Recreational Vehicle. Visit RV shows, read RV magazines, check out buyers guides. Get information from the RVIA (The Recreational Vehicle Industry Association), talk to other full-timers, request brochures and review the details and layout of each RV you are considering. 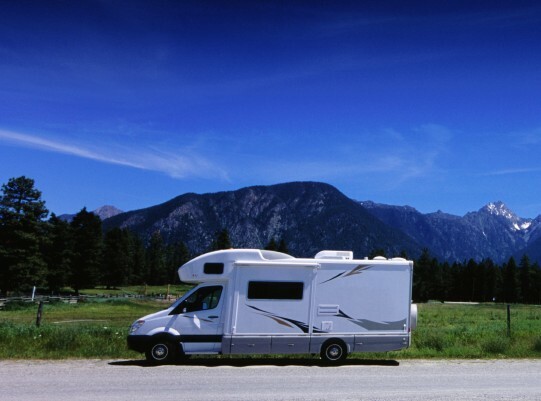 If you're considering an RV with a motor, be sure to drive it before purchasing. How many people will be living in the RV? With only one or two people even the smallest RV can work for a full-timer. We have seen many tiny trailers with two adults and several children living full-time in them. We wouldn't recommend it though. Will you have grandchildren visiting in your RV? Most RVs have couches that convert into beds or tables that convert to a sleeping surface. Making the table into a bed and back everyday would work in the short term, but for long term visits it could become a real hassle. If the kids will be traveling with you often consider an RV that provides them with their own space. During your RV search consider a bunk house providing a space for toys, play area and a TV just for the kids. Are you bringing any pets along with you? How big are your pets and how many do you have? Any small cat or dog can easily live in an RV, but if you have a giant dog you'll want to consider that when selecting your RV. We have seen tiny trailers with two huge dogs and three people living in it. Surely no one has much breathing room. Where do you want to camp? Think about the lifestyle you want to create. If you want to visit National parks? Most of these parks can not accommodate anything longer than 30 feet. Most RV parks will fit a 36' trailer and tow vehicle without any problems. Some say they accommodate Big Rigs, but getting in and out can be challenging. Older parks were not designed to accommodate the longer RV searching for an RV park could be challenging if you have a 40' or longer trailer. What conveniences do you want? Only you know which conveniences are considered must haves? Do you want space for a washer dryer or do you prefer a laundry mat? What size should it be? Are you going to be parked most of the time or will you be constantly traveling? There is a wide range of lengths available. Driving a really long rig and maneuvering traffic can be challenging if you will be traveling a lot. What are your hobbies? If you have hobbies that take up space you'll want to take that into consideration when selecting your RV. Is there room to store and create? Could you customize the space to make it work for you? Does the RV have Slide-outs? Look for rigs with slide-outs during your RV search. Newer RVs offer slide out rooms that provide an extra 3 or 4 feet of space. If the slides are on each side it opens up to a spacious living area. RV Search Tip: A good thing to consider with slide-outs is what you can get to when the slides are in. If you can get to the bathroom, refrigerator and the bed it'll be much easier when traveling to pull over for a break, a snack or a nap. When parked sometimes the winds are so strong the slides should be in to protect any slide covers, but if you can't walk down through the trailer with the slides in you could be cooped up for hours waiting for the wind to die down. Look for one that you can walk through even with the slides in. Four season insulated? If you will be traveling through very cold or hot weather you might want a four-season insulated RV. Heating and cooling your rig is much more efficient because of the added insulation. Boon docking: If you will be boon docking for extended periods of time you'll want large propane and holding tanks, so you won't have to fill up and dump as often. Keep this in mind when doing your RV search. Weight of the trailer: If you will be choosing a travel trailer or fifth-wheel consider the tow ratios of your tow vehicle. Be realistic when doing your RVsearch and in your purchase decision. Our first motor home was a 26' with no slide-outs. We were new to full-timing and were traveling constantly. I thought the 26' would be easier to maneuver in traffic. It didn't have any storage space. We had to climb over the bed to reach clothing, lay on the floor to dig for can foods. We had it packed with so much stuff that we were climbing over things to get from the cab to the bathroom. Can you believe we didn' t test drive it before purchasing it! It was crazy! Now we have a fifth-wheel with an unbelievable amount of storage space, a closet just for the washer/dryer, and an 8' living area. It's much more comfortable RV living in an RV better designed as a full-timing RV. To get more ideas on selecting an RV check out our Get Started Rving Guide! There are all kinds of articles to help you get started Rving. When Doing an RV search Should I Select a Motorhome vs Fifth Wheel?